The creation of TheBattleContinues.org was a very important step for me that allowed me to transition from being a front line Army doctor treating all manner of battle wounds to an emergency room doctor to becoming an entrepreneur who can affect change and help improve veterans’ lives in a very direct way. In the years leading up to the launch of TheBattleContinues.org, I frequently got involved in activities that would help raise funds for our nation’s veterans. I was happy to do that. But one of the things that struck me regarding these fund-raisers was that the amount of money that went to overhead and administration within these charities seemed too much – even among the best of them. And the best of them run at about a 25 percent overhead related to administrative and fundraising expenses relative to the amount of expenses that actually go to the programs and services a top charity delivers. ​Dr. 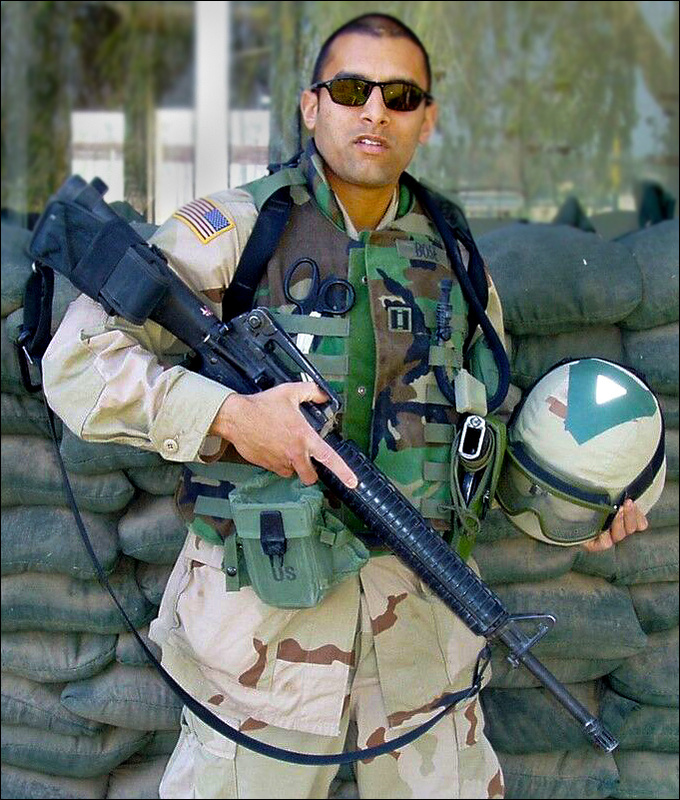 Sudip Bose as a captain serving with the 1st Calvary Division in Iraq in 2004, creator of TheBattleContinues.org. I thought I could do better than that. TheBattleContinues.org is an organization founded on the idea that even after serving our country abroad, the battle for many veterans and their families continues at home. As a combat physician, Army war veteran and Bronze Star recipient, I wanted to establish TheBattleContinues.org to help alleviate many of the burdens veterans come home carrying while simultaneously promoting improved health and well-being. The Battle Continues Inc. is a 501(c)(3) nonprofit organization aimed to raise awareness and help veterans who have returned from war; 100 percent of money donated to the organization goes towards assisting and supporting veterans. I joined the Army at the age of 21 and was an officer in the Army for 12 years. It was a great way to serve my country. I’m very thankful for the incredible opportunities that my parents have received, and I’ve received as a result, after they immigrated to America. I was fortunate enough to have done my undergraduate pre-med work at a top school in Chicago, Northwestern University, and went there for medical school as well to become a doctor. I was a practicing emergency medicine physician in the Army, and on Sept. 11, 2001, I joined an infantry unit, and I had the honor of serving on the front lines in Iraq during the Iraq War. And it’s that experience on the front lines of combat as well as the front lines of the emergency room that I hope to use to help others through TheBattleContinues.org. On the front lines, we watched as our normal life passed us by. Soldiers missed the birth of their first child, their child’s first words and first days of school. They missed birthdays, graduations, and funerals of family members. We missed good food, quiet, a day off, showers, carpet, and mattresses. We missed everyone and everything in our lives. After a grueling front-line tour through the peaks of insurgency in Baghdad, Najaf, and Fallujah, my fellow soldiers and I had seen everything ever shown in a war movie. We saw the most hardened men break down and cry. We believed in the cause and at times questioned it. We were told the truth. We were lied to. We watched and read about supposed “experts” and “officials” sitting in their air-conditioned offices, ordering us into battle, boasting, “they know how hard it is.” They will never know. Providing care to the enemy who spits, swears, and glares at you as you attempt to listen to his lungs. He recently killed two fellow soldiers. He would have killed us too, if we had driven over his explosive device. He hates me. Receiving genuine gratefulness from Iraqi civilians, fellow soldiers, and commanders after saving a life. They love me. I understand what many veterans face coming home – they make it through combat and come home only to fight another battle, perhaps harder than any they had encountered before – some with physical ailments, some with psychological ailments, some with a combination of the two. Our board of directors at TheBattleContinues.org will use the donations we receive to help veterans and their families coping with their own battles. We will help connect veterans with physicians who can help them live a better, more fulfilling life. I think it’s important that one of the functions of TheBattleContinues.org is to help raise awareness about the struggles veterans go through upon return from war — especially those injured in the Iine of duty or suffering from extreme combat stress, as well as the families of fallen soldiers. Many veterans return from battle only to face grueling physical challenges and enormous financial burdens. The battle continues for many soldiers returning home from war in that regard. At TheBattleContinues.org, we are leading the effort to raise awareness about post-traumatic stress disorder (PTSD) as well as traumatic brain injury (TBI), two types of “invisible wounds” that affect some of our returning heroes. As a war veteran and physician, I’ve witnessed firsthand the devastating impact these disorders can have on soldiers and their families. Many soldiers with symptoms of PTSD do not seek help for fear of being stigmatized or hurting their careers. We hope to provide a place of shelter, comfort and safety for returning veterans coping with these kinds of injuries and provide the kind of treatment and care that respects their privacy but deals effectively with getting these veterans back to a more normal existence, even if it has to be a new normal for some. At The Battle Continues, Inc., we not only want to advocate and mobilize resources in support of veterans, we also want to educate Americans on healthcare and raise awareness of these veterans issues through the power of education, thereby creating a multiplier effect. We hope to cause a ripple effect in our nation as support spreads from one to another. Together we can help Americans rally around our troops, which will in turn provide our soldiers the support they need. Each of us can make a difference, but one person can’t do it alone, nor can one person change the world alone … it takes an army of people. Healthcare and veteran issues affect all Americans. Empower yourself by staying informed.